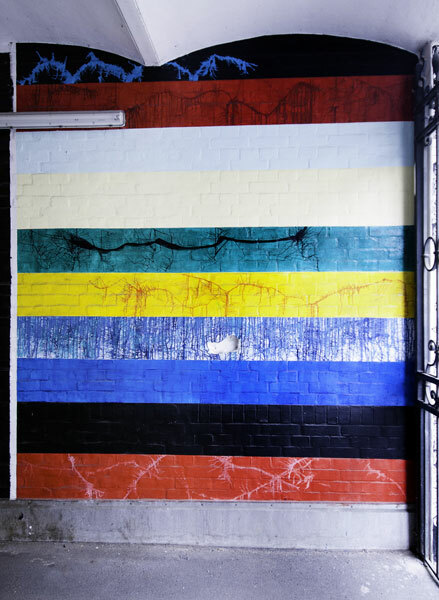 The FELLINI Gallery Mural project coincided with the renovation of FELLINI Gallery. After 2 months of work, it brought together artists of diverse cultural backgrounds in one experience, combining a variety of medias and references. The artists expressed their distinctive and unusual styles with their own interpretations of free ideas. 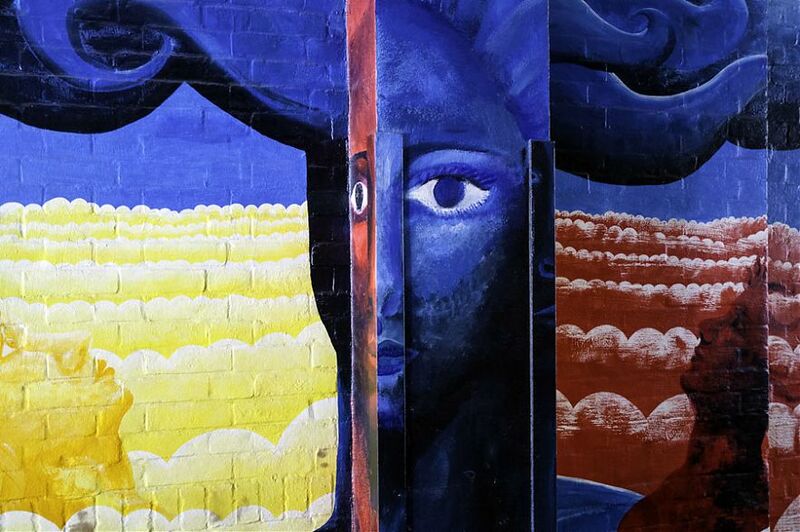 The result was a transformation of the gallery backyards into vivid and diverse displays of an imaginary world, which come to take on a life form of its own. These images have been inviting viewers eversince to a journey through a dream-like land, attracting many random passengers to explore its landscapes and evoke their imagination. 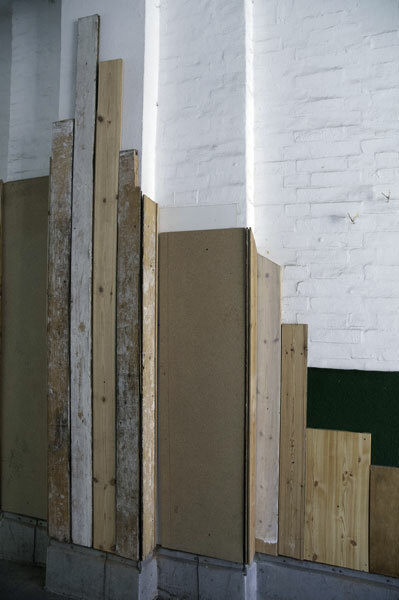 Participating artists: Stefano Bosis, Ewa Dajer, Tamara Fleming, Martin Gak, Ewen Gur, Jennifer Killian, Glen Keelan, Sonia Orfila, Charlotte Osinga Duncan Passmore, Dario Puggioni, Mark Mayer, Angelo Nuzzolo, Richard Rabensaat, Oliver Roura, Petra von Schmude & Bernard Föll, Alessandra Senso, Gaby Taplick, Melanie Thewlis, Andrew Thomas, Winston Torr, Aiva Veinberga, Craig Wilson, and Mele De La Yglesia. Born in Cadiz (Spain), graduated in Visual Art in Madrid and design inHildesheim (Germany), Mele de la Yglesia now lives and works in Berlin. 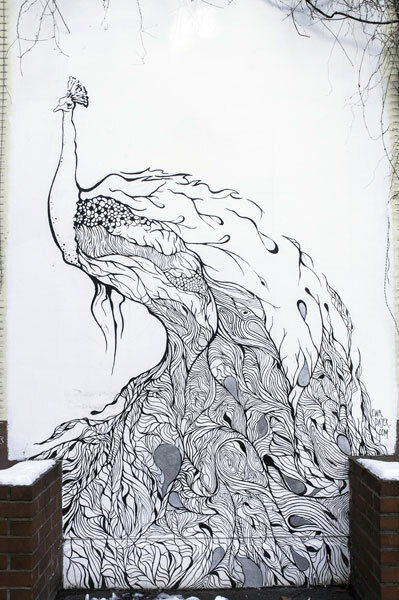 Mele’s mural stretches over the entire entrance arch over the FELLINI drivewaywith intricate fanciful black and white lines, forms, and shapes, modeled on thoseof organic natural structures. The vibrating appearance of the piece gives theimpression of a mysterious overgrown landscape. De la Yglesia often workswith only two colors using simple and strong formal combinations. Beauty is anintegral part of the work transporting the roaming viewer to the rules of anotherorganic world for a brief moment. Torr was born in Toronto, Canada. He grew up in a Taiwanese-Americanhousehold in Los Angeles, California. After receiving his Bachelor of Fine Arts,he moved to Berlin where he currently lives and works. 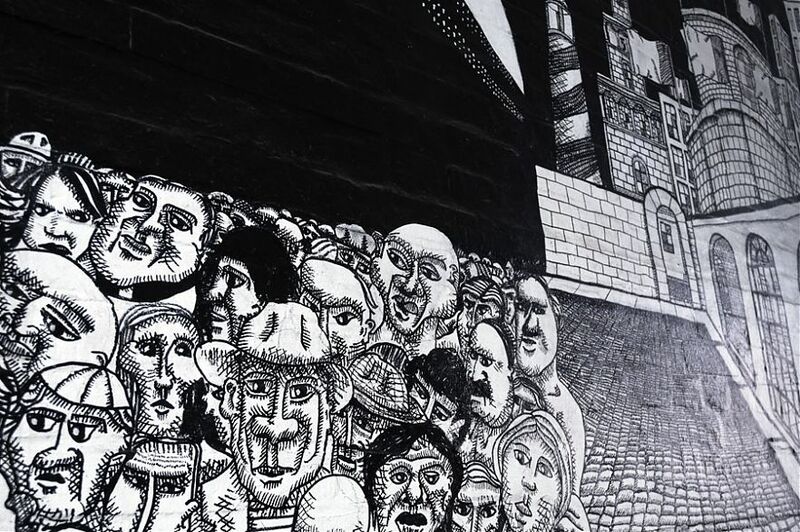 Torr's mural entitled "Giant Little Creatures" gleams and overlooks the FELLINIentrance, the figures acting as two-dimensional guards to the gateway. 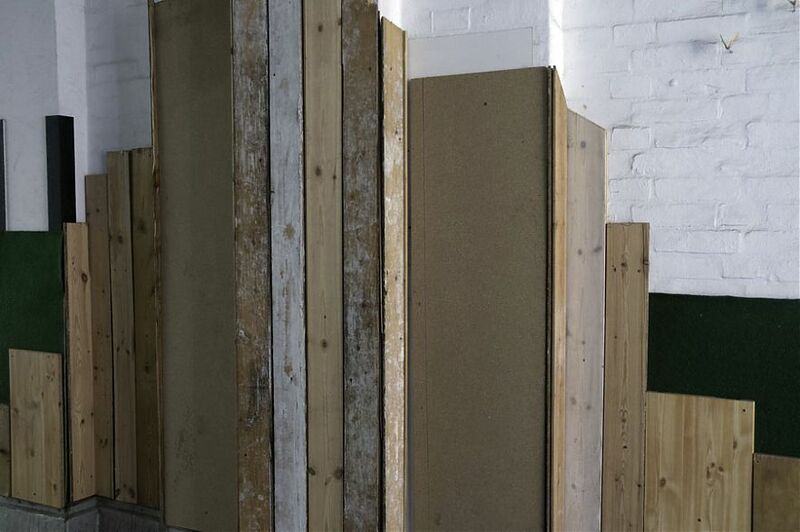 He oftenuses newspaper as backgrounds in his work in an attempt to restructure hissocial environment. In the epic scale of his work, scarification slash gesturesacross the figures against the re-assembled pieces represent freedom fromsocietal crucifixion. 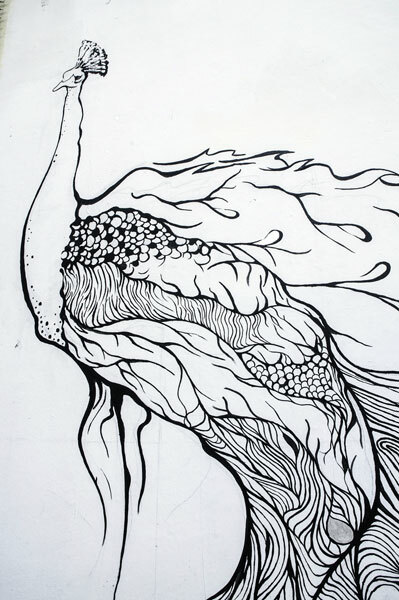 Jennifer Killian is a freelance artist, muralist, and illustrator based in the SanFrancisco Bay area. Her work often depicts nature by contrasting its fragility andpermanence with the prevailing motifs of butterflies and trees. 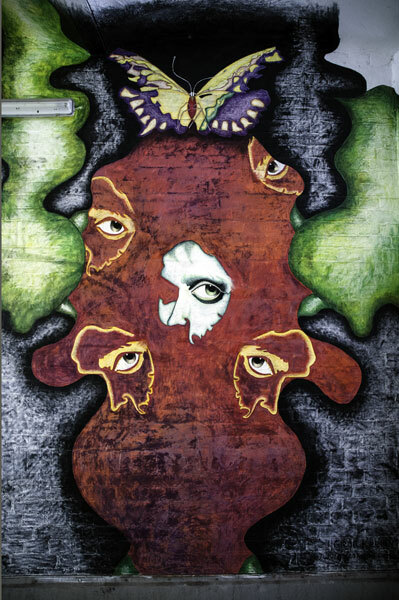 Killian’s Fellinimural protrudes into 3-dimensions, peering out into the entranceway on thecornered wall. 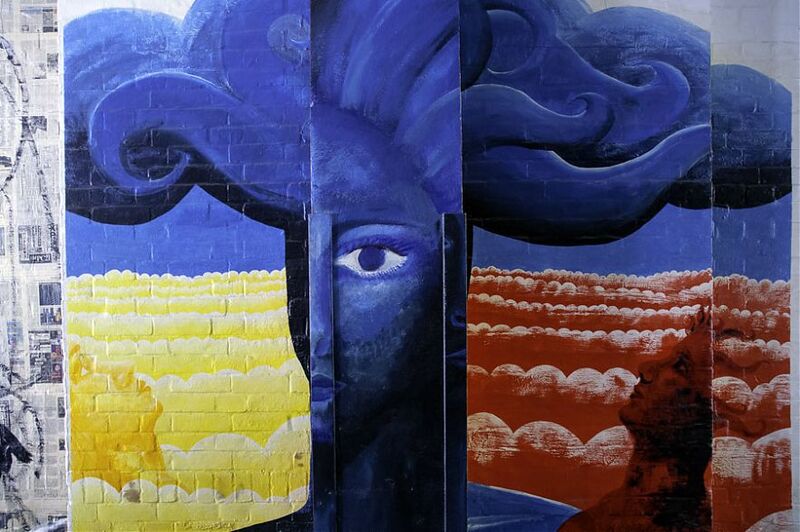 It depicts three female faces in yellow, blue and red, surroundedby billowing clouds. Their heads gaze upward with godly impressions toward astratosphere of primary colors– staring out astutely into the billowing clouds, everaware of a far-off unseen real world. 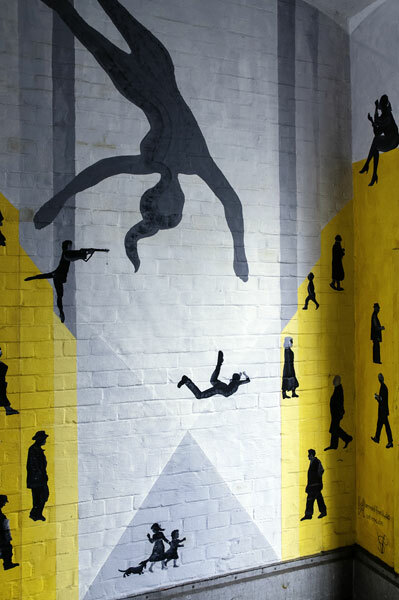 The yellow and black FELLINI mural, located second to the end of the first archwas painted by Richard Rabensaat, an active journalist and freelance artistestablished in the Berlin art scene for over 20 years. 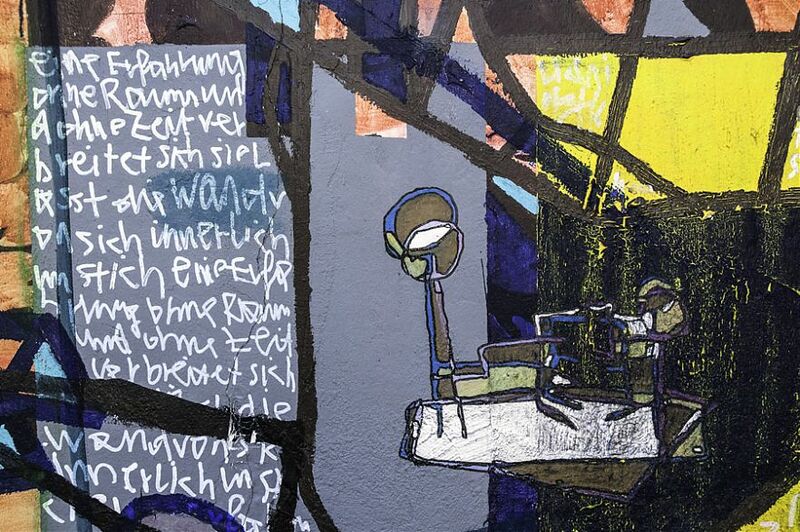 Rabensaat often worksbehind the scenes writing for magazines such as Zitty, Welt, and Tagesspiegeland is most renowned for his performances, using various mediums todemonstrate the broad ranging themes in his work. 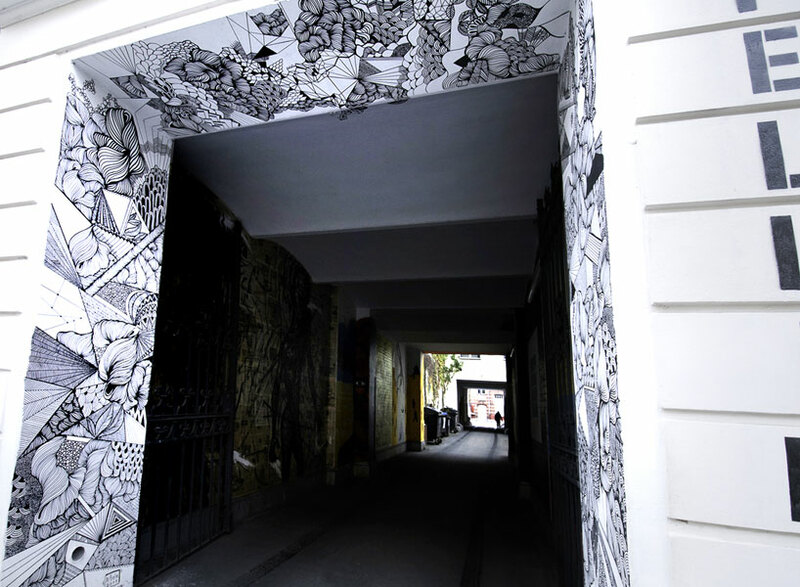 Rabensaat’s vibrating yellow mural draws the viewer in with its bright saturationand stark black contour lines. The figure portrayed in the middle, a naked femalewith her hair tangled around her body, resembles that of Venus from SandroBotticelli’s The Birth of Venus. On the top of the female figure, the artist arrangesa head of a rhino on the shoulders and in a disconnected way, replaces the rhinofeet into the landscape pointing upwards like trees. The scene uses historicalimagery and motifs of monstrous new world beings in a formal composition,reminiscent of a Tarot card, medieval illustrations or biblical motif. 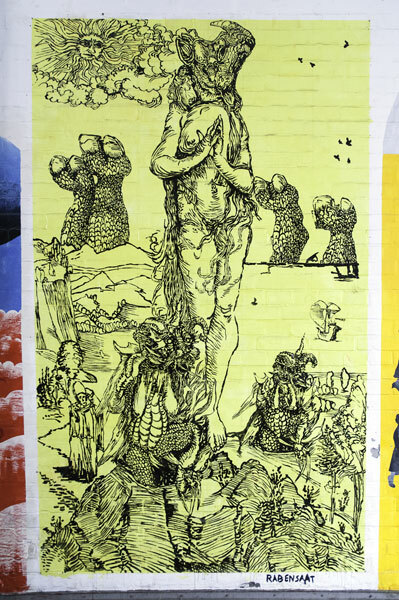 For the FELLINI mural on the end of the first left enclave, the artist pair Bernard Föll and Petra von Schmude collaborated together. Bernard Föll was born in Stuttgart and educated among bohemian West Berliners in the 1970s. 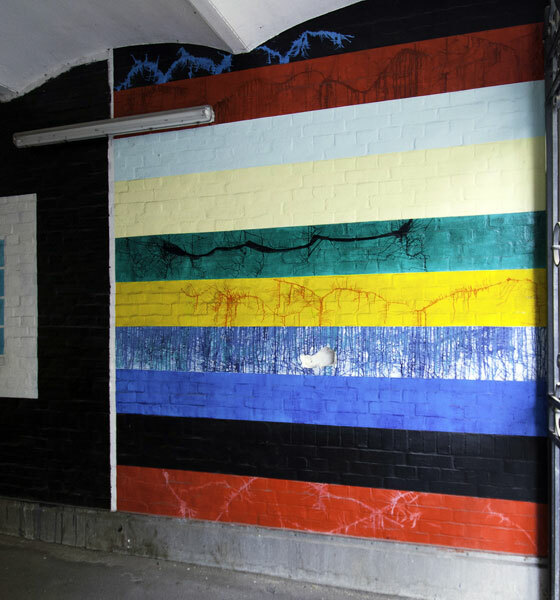 After playing his part in the Super-8 movement(performance and film), Föll established the “10,000” artist group in Kreuzberg.Föll's aesthetic tends toward a clear and print-like style. 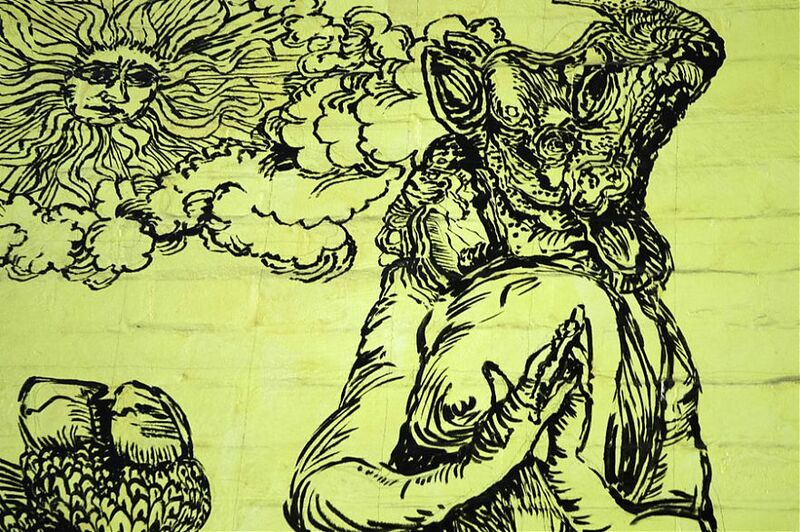 His artworks are oftenreminiscent of stencils, propaganda or advertising posters. 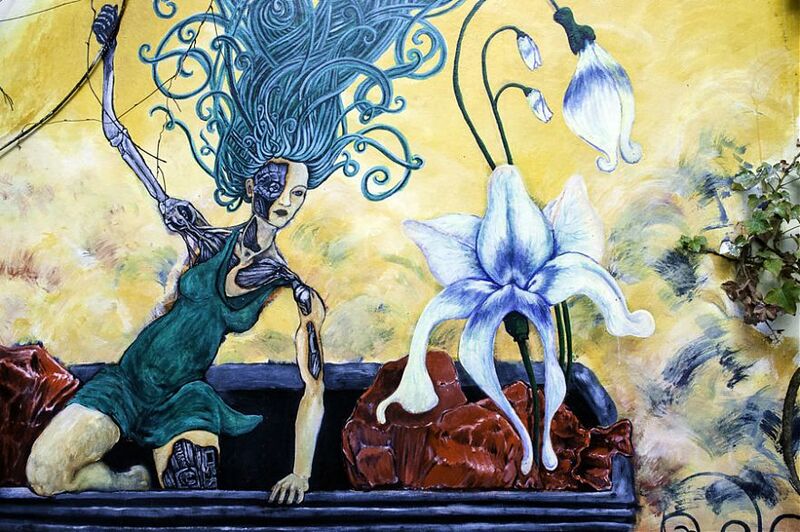 Petra von Schmude is a Berlin born artist who specializes in portraits and depictions of surrealist worlds. After years of drawing von Schmude switched topaint, enabling her to access vibrant visual palate and broadened compositionalpossibilities. For the Fellini mural, the fruit of this duo-cooperation, results an exotic world inwhich silhouetted figures exhibit various simultaneous non-connected isolatedactions; the mundane walk of mother with child, child with dog, man withbriefcase, woman applying makeup, the typical work-a-day play - all arranged ina gravity-less world, over case by the impeding gray shadow of a giant ponytailedwoman falling head first into the world. There is a simultaneous indication ofhorizontal motion (legs astride) and an impression that the postures couldactually be coming downward from the sky like raindrops reminding one of RenéMagritte’s Golconde. 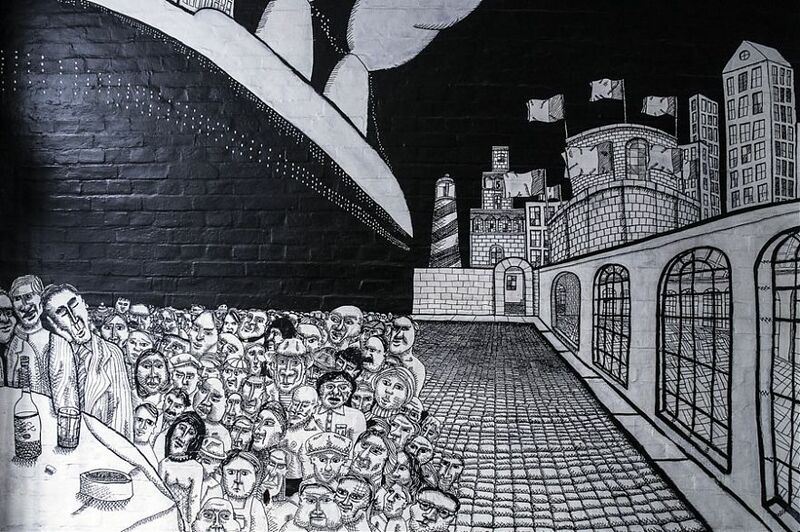 The mural transverses across a corner of the wall openinganother dimension to the society it portrays. Ewa Dajer is a visual artist from Szczecin, Poland. She works with many traditionally design oriented mediums - posters, photography, logotypes andtypography, illustration and graphic design. 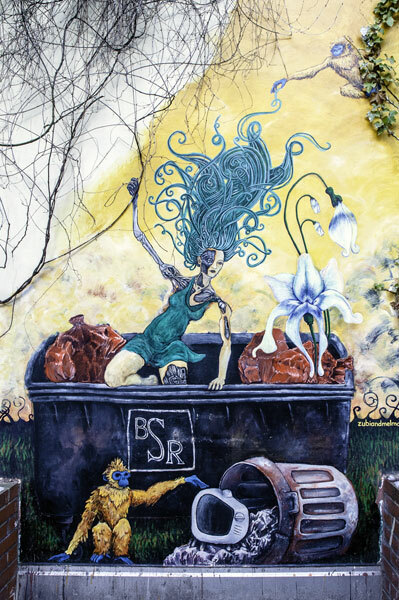 The mural located intentionally behind the dumpster, depicting floral elements,robots and monkeys is an original masterpiece by Melanie Thewlis. 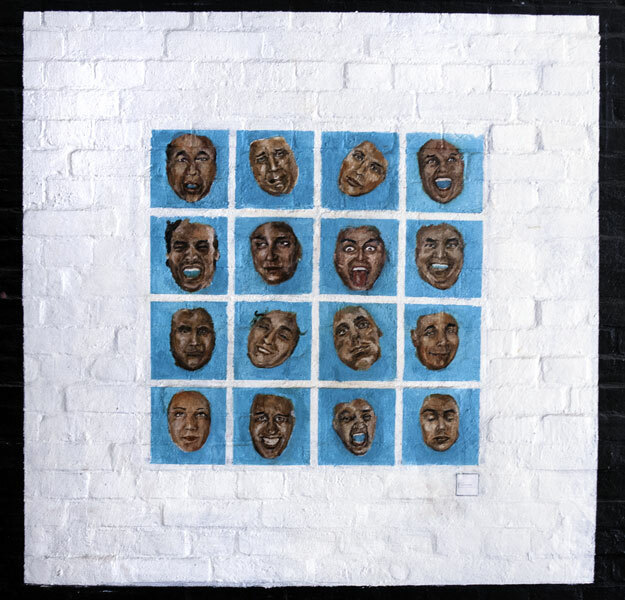 Thewlis studied political science and took part in volunteer work at AustralianVictorian indigenous communities before becoming a multimedia visualartist, well versed in oil painting, digital printmaking and film. Her work showsreflections on her travels and subjects of study particularly the relation ofhumanity to nature and technology. 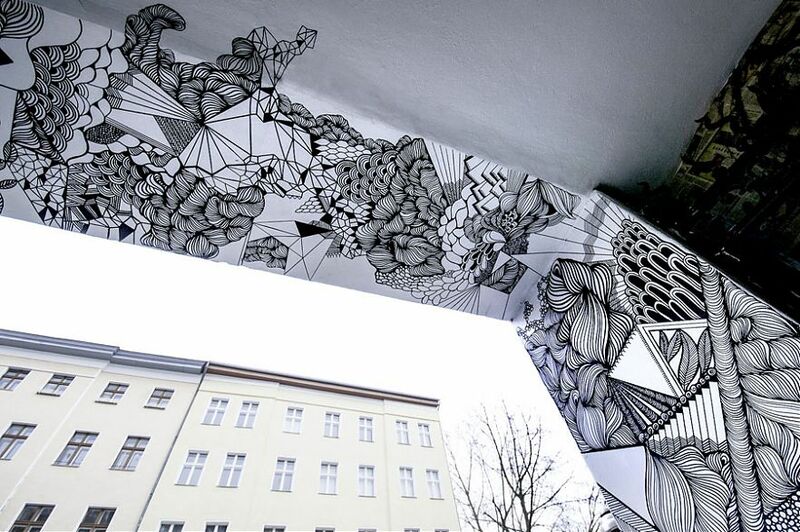 Her immense mural incorporates the real life elements by using the given vines,and presence of the garbage cans as intentional parts of the mural sceneitself. The vines, branches and ivy vines frames the work giving the main figuresomething to grasp onto. 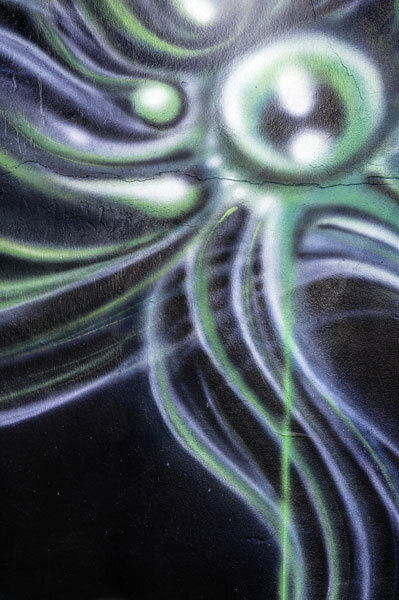 The figure emerging from the garbage can is a half-robot woman with wild green medusa hair spiraling upward. Placed next to heris an equally large and beautiful blooming orchid growing upward out of thedumpster. On her right side there crawls a giant hungry infant head apparentlyteething on a mobile machine surrounded by leaping fish. Above and below themain figure are two curious blue-faced monkeys trying to make sense of thegravity-less hair and the technological waste. 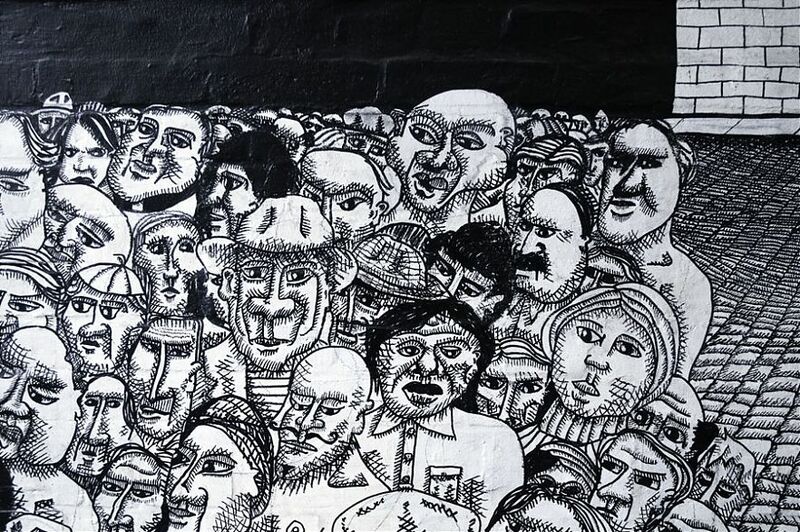 The graphic black and white mural in the beginning left side of the secondFELLINI archway is a work by Argentinian intellect and artist Martin Gak. Gak was born in Buenos Aires, lived for two decades in the USA and receivedhis PHD in philosophy from the New School for Social Research in New York,before moving to Berlin in 2010. He is active as a teacher, writer, consultant andresearcher in the fields of metaethics, politics, neoroethics, philosophy, religiousmorality and secular ethics. 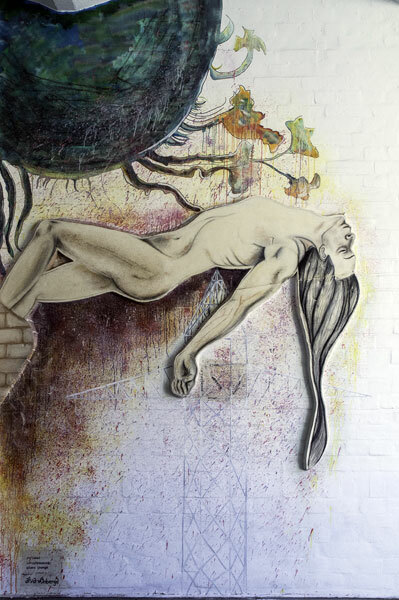 Gaks art also delves into deep social and political topics; political exile,displacement and existential themes of alienation, as well as boredom andloneliness. 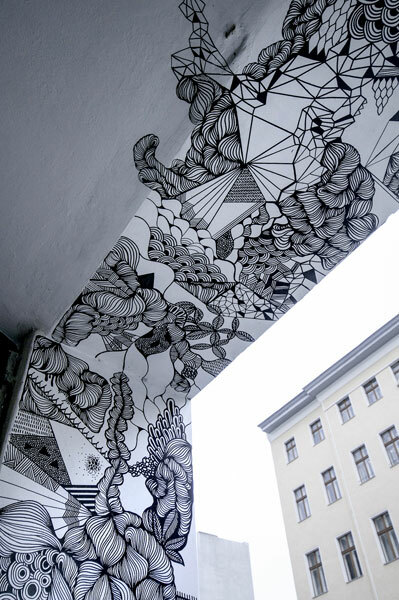 For the immense mural, Gak depicts a scene imbued with heavycounteracting formal and perspectival elements. The work displays a massiveship, docked blocked in the upper left corner which bears down like a massiveweight on the jumbled pushing crowd. The condensed group of heads is seenas incoming passengers, pressed into the left corner around what seems to bea meager bar table offering. On the left side there is a massive fortressing wallof a small town with gridded glass windows, gridded cobble stone streets, andsix flowing flats. The figures push themselves all into the left bottom corner as ifwaiting in line to gain access to the world outside of the painting behind the bartable. 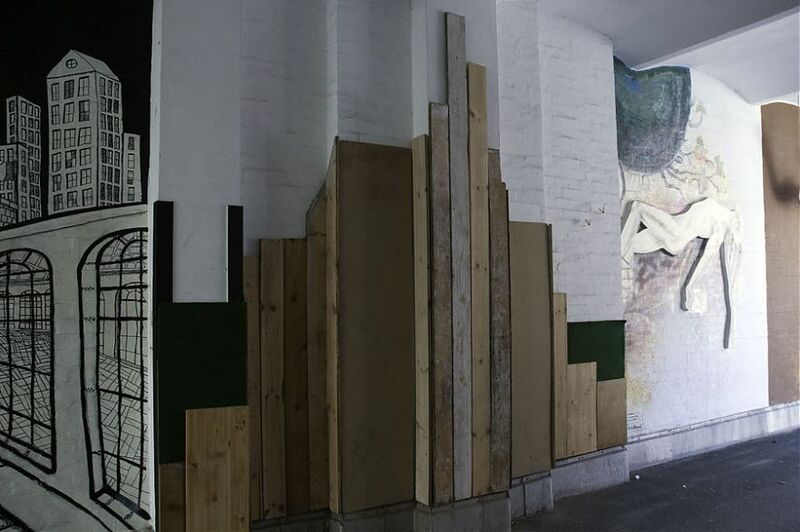 Aiva Veinberga's mural is located at the left end of the second archway,protruding outward into the space with a foam surface on which a reclining nudewoman tilts her head back and seems to levitate without effort into the air. Aboveher is a planet like figure, out of which flowering plants reach down toward thefloating body. The unconscious relaxation of the body seems to be an out of bodyevent akin mind-altering states, hypnosis, ascension to another realm after deathor simply an elevated dream state. Aiva Veinberga is a Latvian artist and craft maker. She has lived in Denmark andBerlin, and is currently based in Dublin, Ireland. two-dimensional works. The minimalist mood is offset often by small wingedseedlings, poking out of the wall on toothpicks. Taplick was born in Delbrück, Germany and studied Fine Arts in Hannover. Shehas been the recipient of many prizes and scholarships such as the KunstpreisGifhorn, Kunstpreis Schlosspark, Preis der Reidel de Hean Stiftung, StiftungKunstfonds and more. 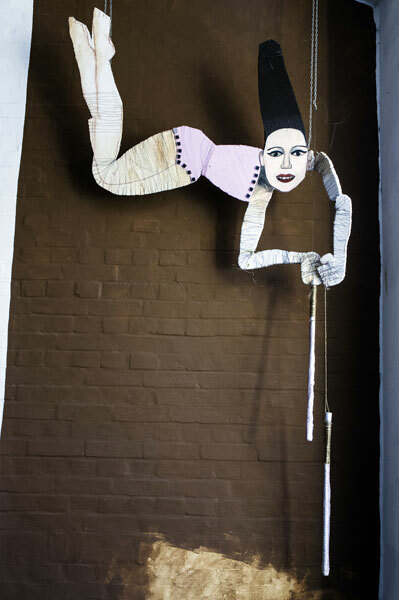 Orfila’s installation at the left end of the second arch presents a woman danglingdown as trapeze artist or magical fairy in a fanciful outfit with sticks in her handsthat clap against the wall. 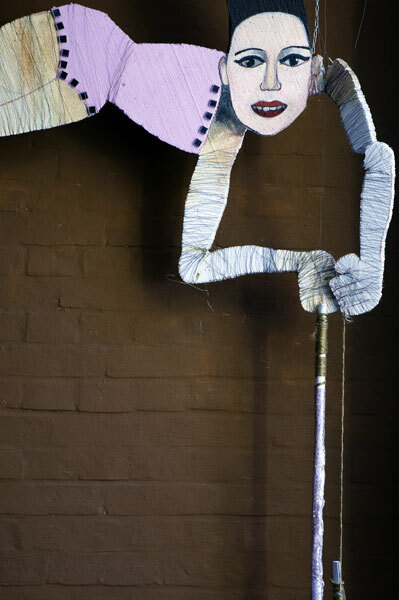 The figure dances with beautiful absurdity in the windraving her batons as she smiles intently at the people entering under the arch.The figure lives making light of the passing real world. Sonia Orfila is an artist from Mahón, Spain. She studied illustration in Barcelonaand has been present for many years in the Berlin art scene. Tamara Fleming was born in Alaska, USA. She studied for her BFA in California,and then continued her education in Vienna, Austria. She lives and works inBerlin. 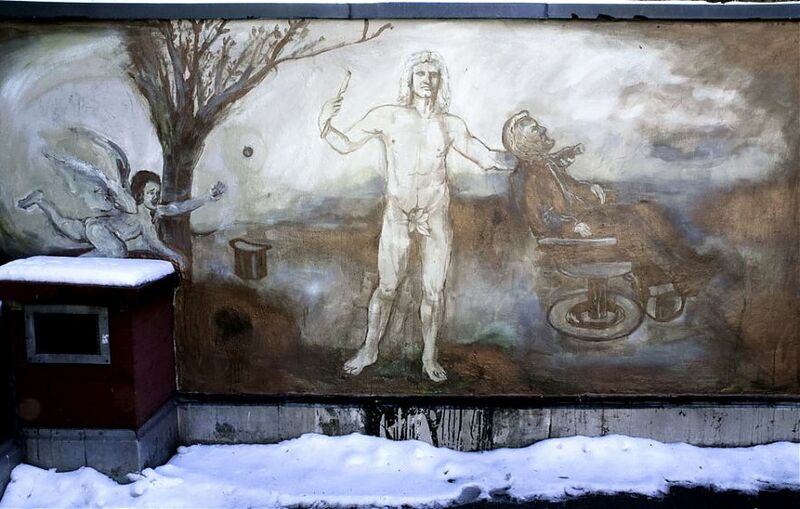 Fleming’s mural for FELLINI is an adaptation of her painting entitled Abraham(Lincoln) and Isaac (Newton). The work is made completely using copper basedpower and oxidation. The themes embrace two main ideas namely autopoiesisand parody. 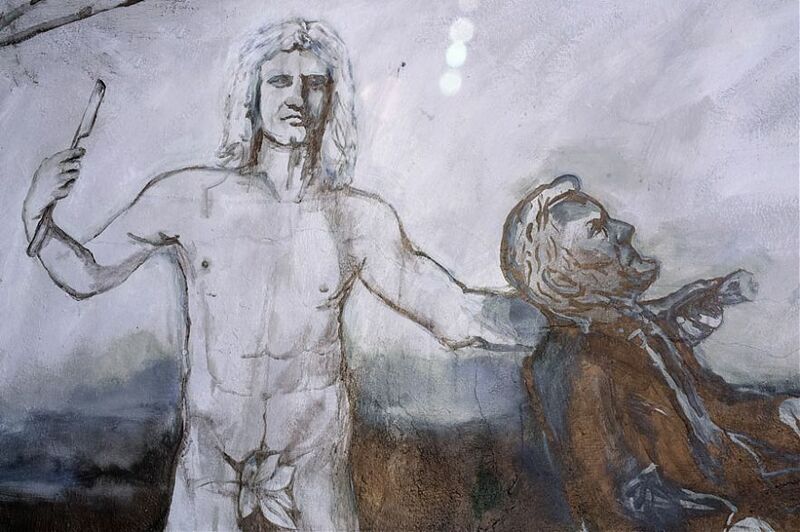 In the foreground of the piece stands Isaac Newton in a pose fromAlbrecht Dürer’s Adam and Eve, Isaac acts as a barber, holding a razor and ashaving brush to the seated and bearded Abraham Lincoln. The story presentedis a parody and reversal of the roles from the biblical story of Abraham and Isaac.In this scene, it is Isaac who wields the razor. In a myriad of references, Lincoln'shead is taken from the U.S. one-cent coin. In an autopoietic way his materialarises both in and outside of this coin - as the coin is shaven the copper paintingcreates itself. Craig Wilson created for the FELLINI mural project a futuristic work of a floatingmachine-man, which tells an open-ended story of things to come. 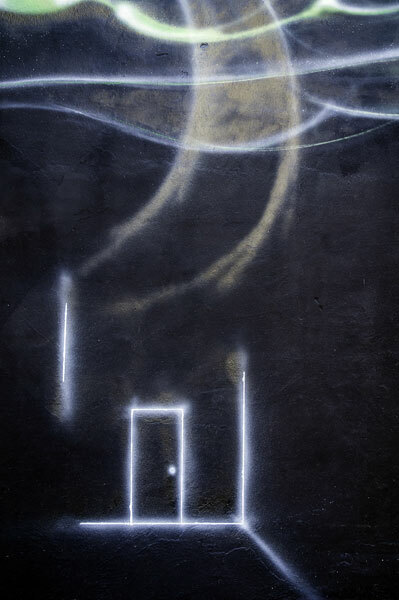 The imageis framed by perspectival inward moving machine-like structures or buildings.In the center there is a ghostlike machine skeleton holding out a lighter with ablue flame. The figure's blue-brained head is being sucked upward, and its bodyis a mechanized manifestation, stripped of any skin with long prevalent bonesand bronze lungs. 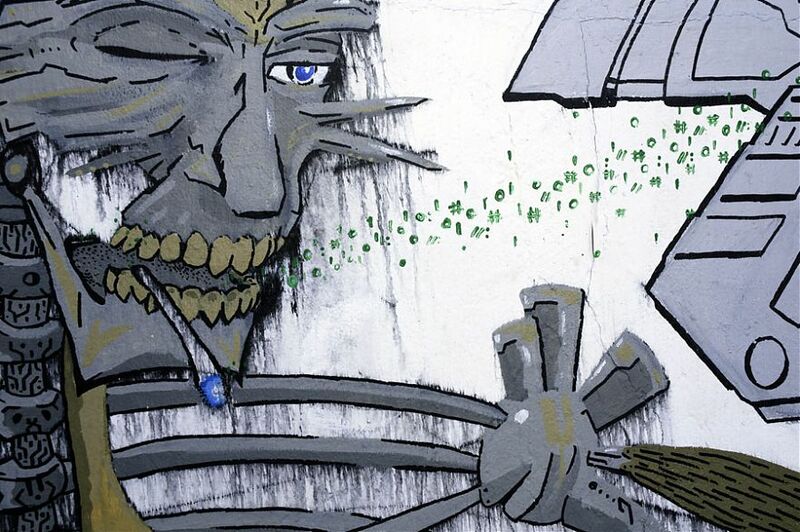 The eyes show signs of intoxication, as tiny green illegiblecomputer icons stream into the air from his mouth and the legless body driftsupward, spiritually alive in an unsettlingly human way. Angelo Nuzzolo was born in Benevento, Italy and studied philosophy in Florence.His work is inspired by Friedrich Nietzsche’s vision of circular time, Frank LloydWright’s concept of organic space and Stanley Kubrick’s aesthetics. 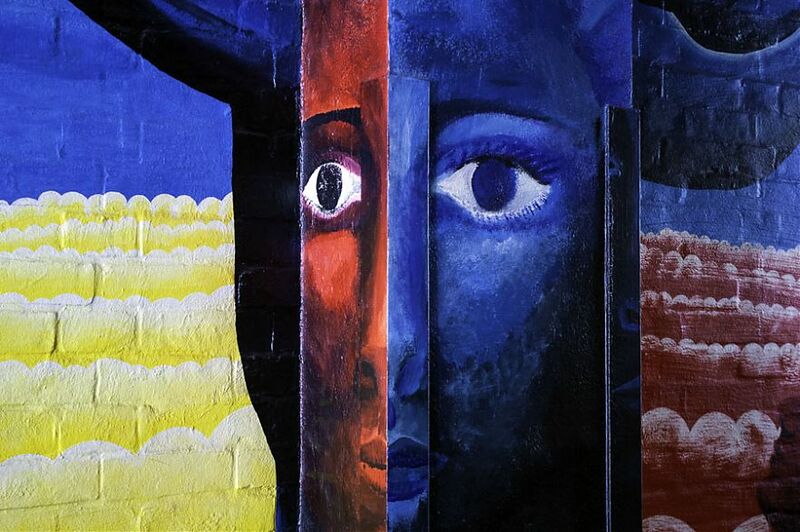 For the FELLINI mural he uses a fluid airbrush technique to create forms relatingto the title "time and space". The work is placed against a full black background,with a surreal cloudlike structure bearing an eye and surrounded with cloud-formwhips in the upper sky. Hanging from the cloud eye is a green dial or clock, andbelow is situated a light infused doorway into the unknown. 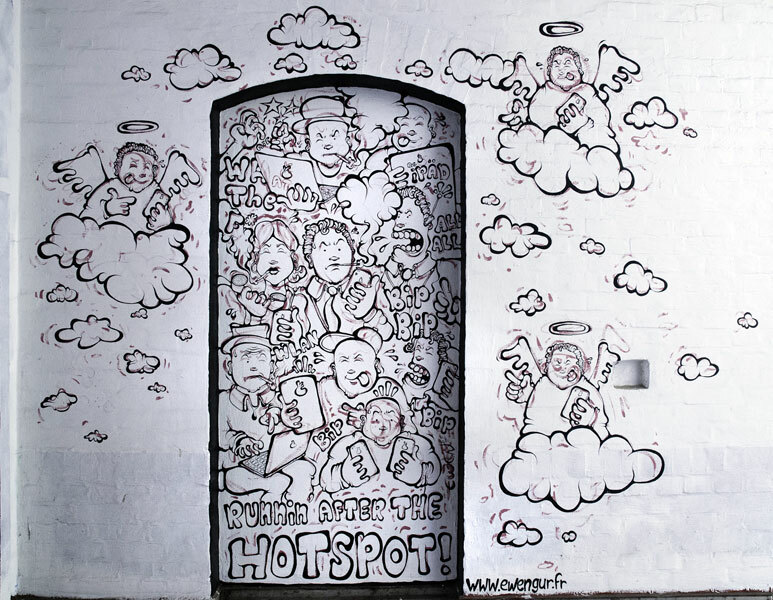 Mark Mayer grew up in 80s/90s Vienna and got involved in street art at a youngage. Perhaps as a result of being raised in conservative surroundings, joiningthe military and studying law, Mayer went on to concentrate heavily on painting.In his work one can discern influence from Cubists, Fauvists and early AbstractExpressionists. and little images within greater ones transforming into shapes of faces, housesand human figures, depicted in a simplified manner reminding of Jean MichelBasquiat or A.R. Penck. 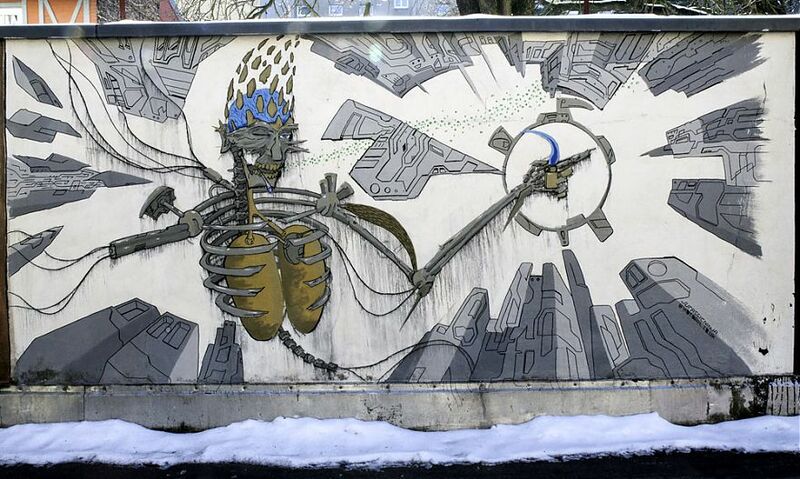 The central figure in the mural emerges from a jungle-like entanglement of bright cable lines hanging from contrasting electric polesstanding on the opposite sides. The squares incorporate hardly legible texts,which narrate stories within and behind the painting and structurally act to holdthe images together. 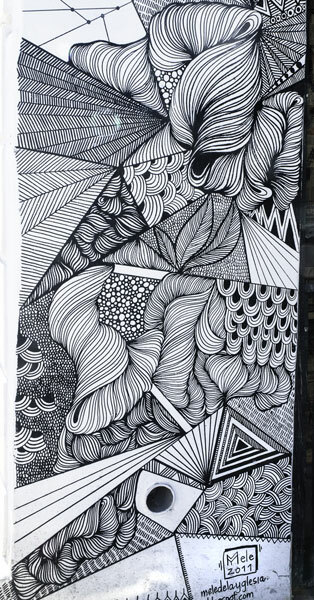 Duncan Passmore is a Scottish illustrator who currently lives and works in Berlinas a member of Gruntwork collective. His work reflects an interest in the humanphysiognomy and visceral elements of society. 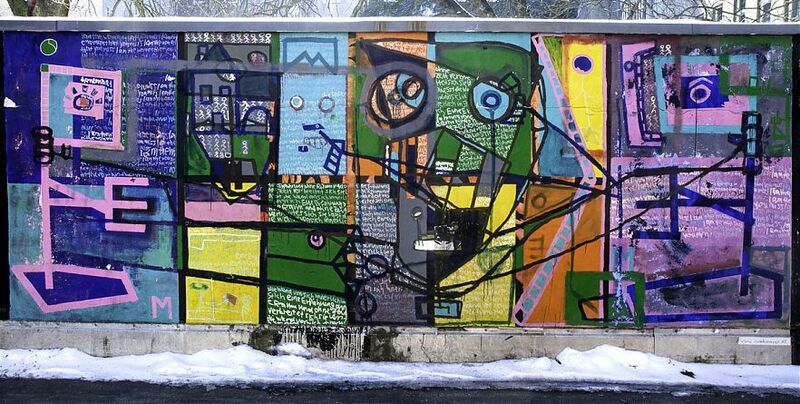 Passmore’s mural in the back courtyard of Fellini Gallery conveys associationswith graffiti, as if it were created on the last subway wagon of a train built ofrectangular artworks. The vermillion and sienna are combined with white andblack, forming semi-circle shapes painted with decisive movement, as if paying aprimeval earth-colored homage to the anarchic face of street. The work situatesitself for the viewer as a depicted nature of determined rush and artistic motion. Born in Brunei and educated in Rome, Dario Puggioni currently lives and worksin Berlin. His works are meticulously constructed with various reactionarymaterials (enamel, aluminum or paper) and layered considerately. The layeringcreates a surface volume and dimension to the skin of the portrayed embryonicfigures. 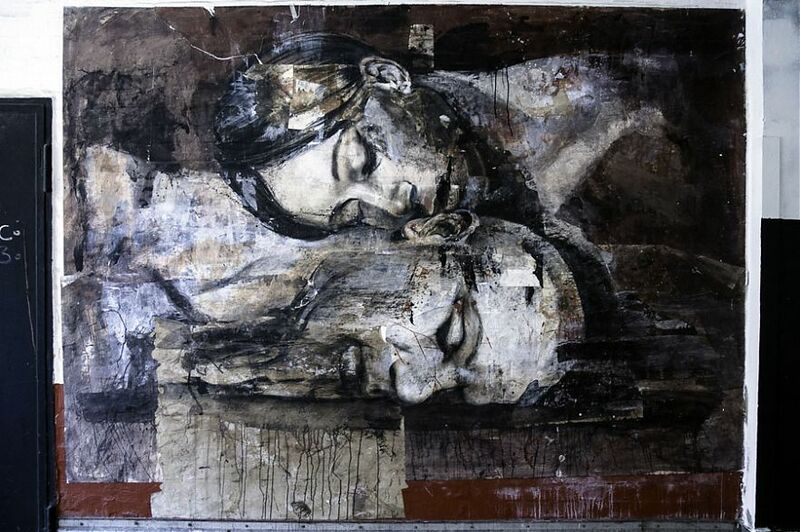 Puggioni’s mural on Fellini Gallery presents two large sleeping heads – femaleresting on a male. 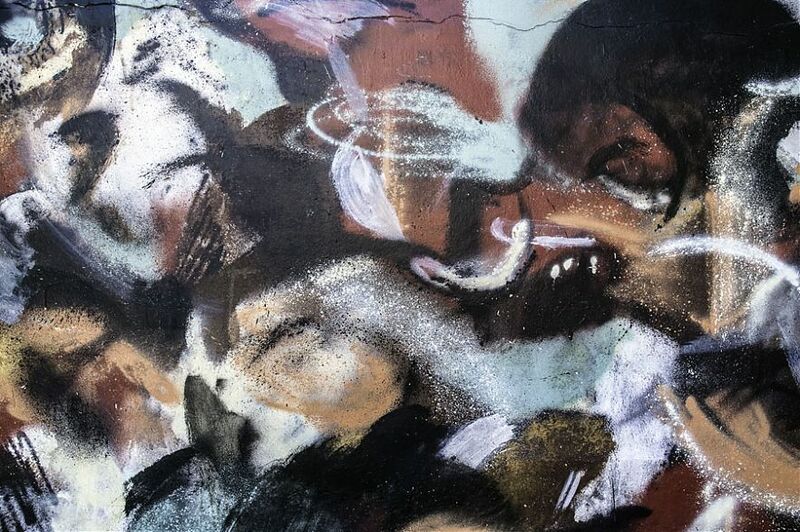 The characters appear to be lovers, sharing an ineffable bond,beautiful yet delicate in the transience of the moment. 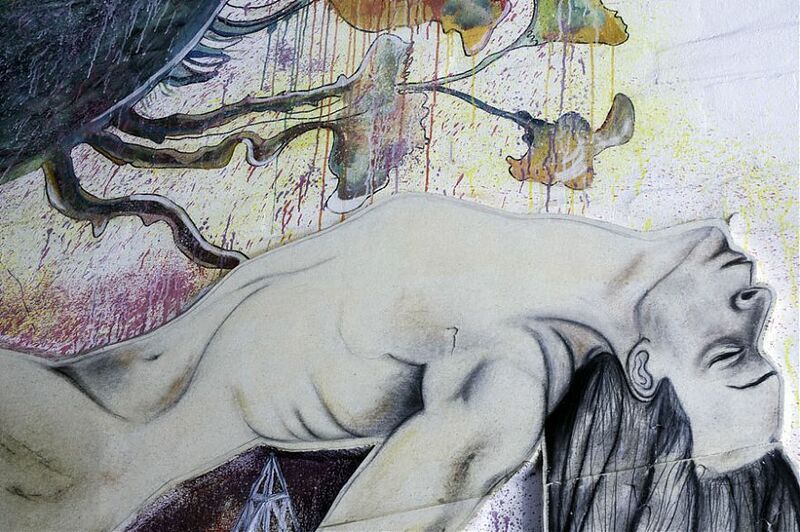 In the arms of Morpheusthey find in the mural an eternal peace and tranquillity. The fragile character ofthe materials used further accentuates the dream-like mood of the piece. As thecollaged paper peels and fades, so does the couple's enduring serenity weld tothe passing of time. 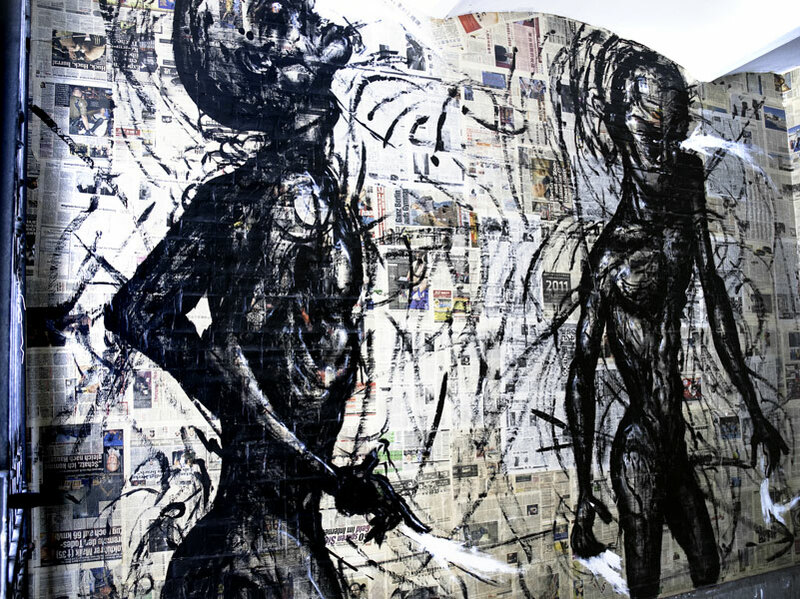 Charlotte Osinga, is a graduating artist at the Willem de Kooning Art Academy inRotterdam. She is a representative member for Holland, in the Berlin Collective.Her work combines the design elements of photomontage, collage, painting anddrawing. 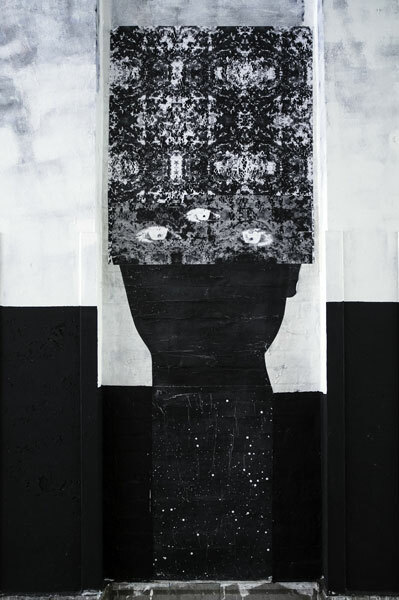 Osinga's FELLINI mural, stands out with its palette of smoky dark coloursand rich textures, evoking a beautiful, dark illusory face. The strong feeling ofdimensions, galaxies and stars is induced in part by the tiny white specks on thepitch black background. The main focus remains on the central female head;the upper half of her face covered by a veil in a kaleidoscopic pattern of frostedglass, with three peering white eyes and slightly open mouth. The third eyepositioned between the eyebrows often refers to perceptive ability into innerrealms and spaces of higher consciousness. Ewen Gur was born in Ambilly (France) and grew up in a French-German family.Former jazz and rock musician Gur works mainly as an illustrator and is involvedin projects regarding fashion, product design, graphic design or press. 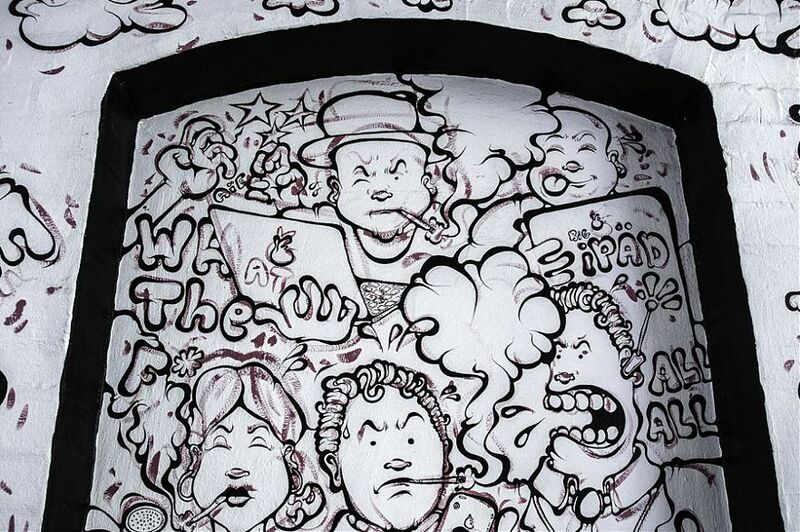 In the mural Ewan Gur portrays cartoon characters “runnin’ after the hotspot”– as the inscription underneath claims. Figures of different age and gender,unlike appearances and outfits, are all congruously angrily fuming at theirmiscellaneous electronic devices in search of a Wi-Fi signal. Squeezed intothe niche in the wall they are observed from above by smirking angels who holdtheir phones in a triumphant manner, as they are presumably online. Ewen Gur'spiece shines as a light satire on an urban world, ubiquitous consumerism andconsequent paradoxes of human technology. Alessandra “Senso” Odoni was born in Bergamo, Italy and studied paintingat the Academy of Fine Arts in Milan. Her artistic practice combines differenttypes of media including installations, murals, digital photography, video andperformance. including the driver. In an irononic twist, the headlights of the car shine a brightyellow color and the viewer is left wondering if the car is in motion or not. 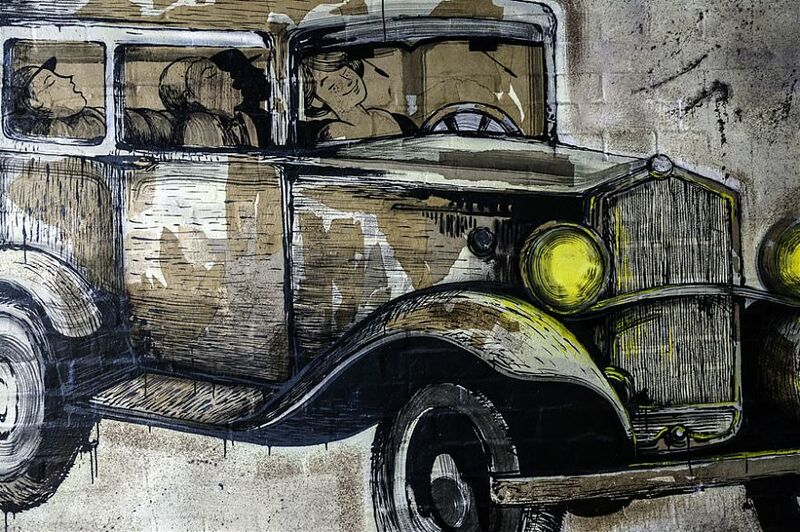 Thecentral sepia colors are made by a background collage of glued ripped brownpapers, circled by a strong black round framework, wherein the central image, anostalgic vintage vehicle has an air of cinematic aesthetics. The vivid and preciselines suggest an affinity with manga and the cinematic world of Miyazaki’s StudioGhibli. Glenn Keelan is a Dublin born artist currently residing in Berlin. 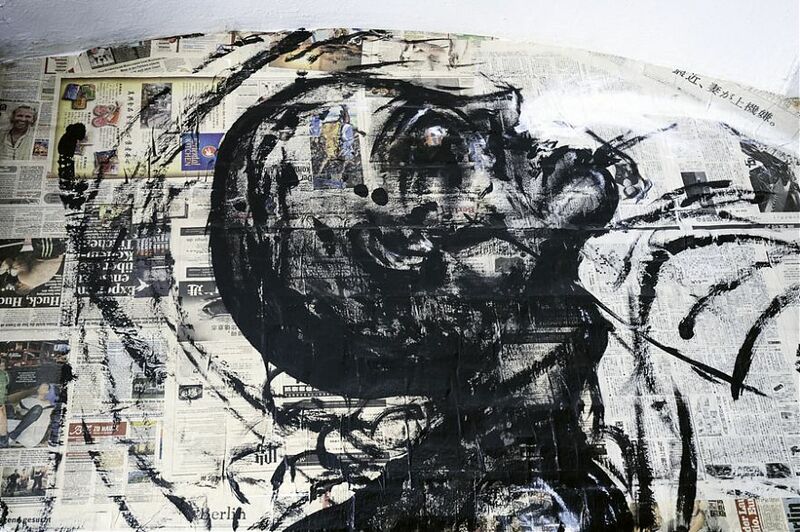 His works areinspired by his intrigue with the perpetual human condition of imperfection andfragility. 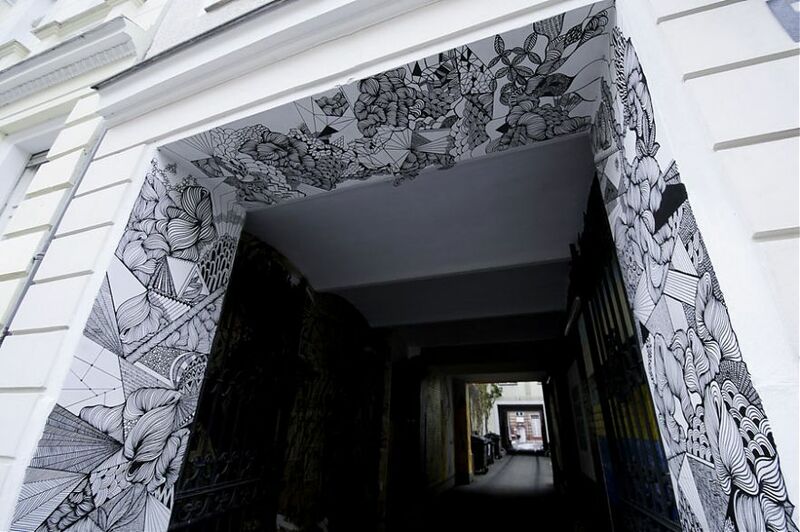 He has devoted many years practicing the craft of drawing in pencil,which comes to the fore directly in his mural work commissioned by Fellinigallery. One aspect in particular that appealed to Keelan to set to work on creating amural for Fellini, stemmed from the unique opportunity which it presented to theartist of being able to transfer his drawings to the outdoors. Thus enabling himto utilize the natural light, size, and space, which was presented. As a pencilartist Keelan’s main challenge became how to use pencils on an uneven bricklain surface and retain the precisions and detail of his other works. The answerhe found was in his use of polychromos colored pencils, and applying water tothe wall thus creating a water-soluble surface. 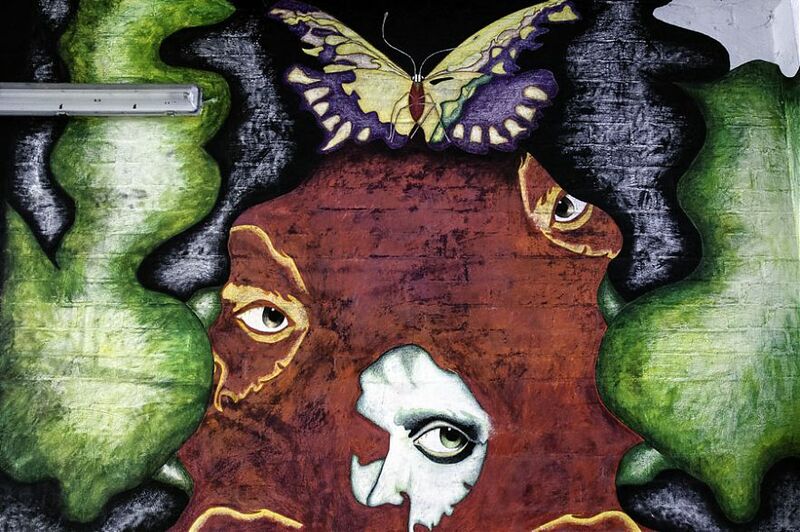 Glenn uses the symbolism of abutterfly to represent freedom and the birth of creativity, whilst the faces suggestthe possible varying facets of the artist himself. 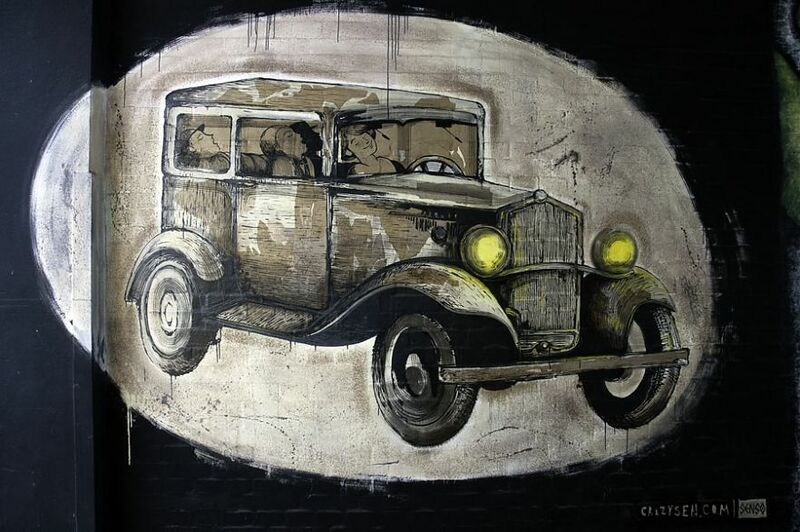 Stefano Bosis was born in Milan and one of his first experimentations with artevolved with his to participation in the street art scene in Barcelona. In thefollowing years Bosis worked as an actor and traveled the world, he returnedto Italy in 2002 with aspirations of becoming a fireman. From there, Bosiswent on to study Digital Communication, at the Academy of Fine Arts in Milanand thereafter gained experience as a TV and film actor, 3D artist and contentmanager. 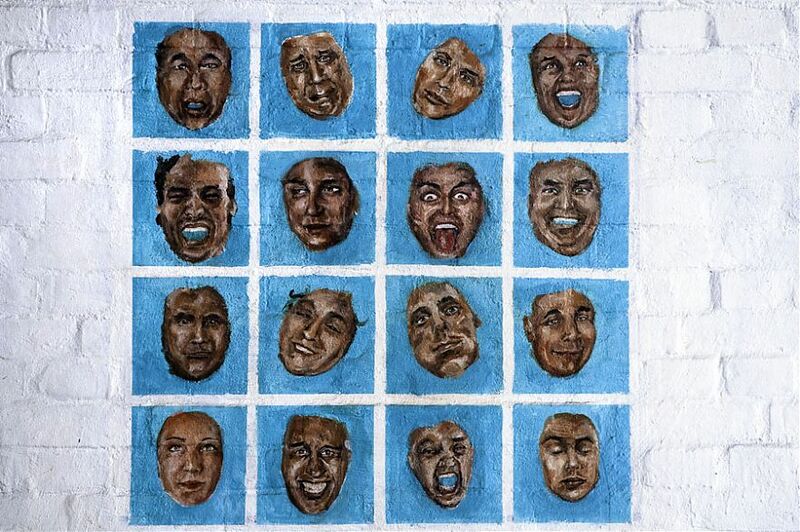 Bosis's Fellini mural depicts a series of faces with diverse expressions in a gridform, set against a bright blue background. The grid format suggests a flattening,commoditized organization of the facial expressions. Each square presents aradically different emotional disposition, overall making a relativizing structure inthat all expressions are happening at the same time but exist independently. Oliver Roura was born in Barcelona where he studied theatre and art. Currentlyhe calls Barcelona and Berlin the two central residences for his life and work. When looking at Roura’s work the viewer is instantly struck with its heavy setin color and a relation to abstraction and minimalism. Roura believes thatinside of every individual lies a formative color, beset with many nuances, as hedescribes: ‘in every individual lies a color, with many nuances. 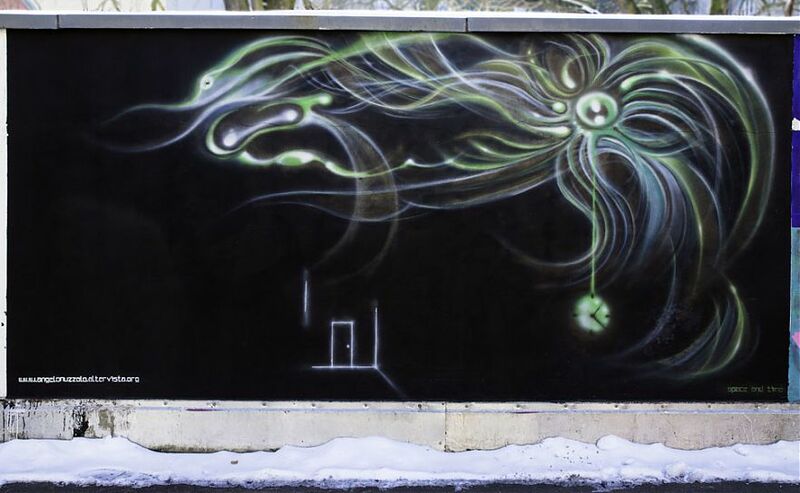 A person does notonly have one pure color of their own soul, but also absorbs the hues belongingto the people around us, our influences.’ In order to make this mural Rourautilized a specific technique with air blowers to make the drips go upwards andsideways. Video on Joan Lillo Arocas!